Details Cobalt yellow (commonly called aureolin) is a potassium or sodium-substituted potassium cobalt nitrite. The compound was discovered in 1831 but not introduced as a pigment until after 1851. 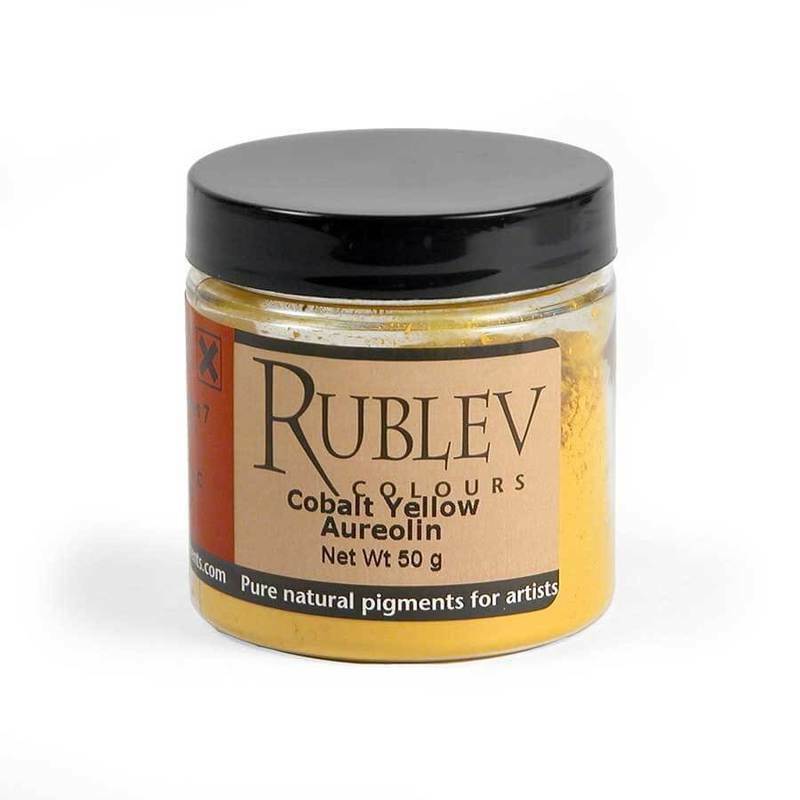 It is an intense yellow that has high tinting strength and low opacity. It is an expensive pigment sold by several manufacturers of artists' oil paints. However, the pigment never gained much popularity as an oil color and was much more widely available as a watercolor. In watercolors, cobalt yellow darkens and fades. It is a transparent, lightly staining, light valued, intense yellow pigment. In oil paint, cobalt yellow is transparent color with good tinting strength and is considered to be permanent. The history of cobalt yellow pigment has been well documented by M. Cornman in 'Cobalt Yellow (Aureolin),' Artists' Pigments. A Handbook of their History and Characteristics, Volume 1, National Gallery of Art (1986). It is generally understood that cobalt yellow was first synthesized by N.W. Fischer in 1831 as part of his study of nitrite salts. However, Fischer did not describe the compound specifically until 1848. Meanwhile, Saint-Evre, working in Paris, independently rediscovered the compound around 1851 and introduced it as a pigment. It first appeared in Windsor & Newton's catalogs in 1861. According to Gettens and Stout, the pigment was reputedly made popular by the American watercolorist Aaron Penly and the German artist Arthur Mühlberg. According to Cornman, the principal method of preparing cobalt yellow was by mixing together solutions of cobalt salts with acetic acid followed by the addition of a concentrated potassium nitrite solution. Cobalt yellow would then slowly precipitate as a yellow crystalline mass. Cobalt yellow is slightly soluble in water and is darkened when mixed with sodium sulfide and caustic soda. In admixtures with organic pigments, such as lakes of cochineal, indigo, etc., it causes the decomposition of these; the organic colors become altered in hue and cobalt yellow becomes a brownish hue. Cobalt yellow absorbs a moderately high amount of oil; about 55 grams of linseed oil per 100 grams of pigment to make a paste. It has been noted in some manuals that the pigment works better as a watercolor than it does in oil, and is highly valued on that account among moist colors used by artists. According to Uebele it requires six parts of oil to four parts of the dry color on mixing and grinding. Cobalt yellow is considered slightly toxic, and hence care should be used in handling the dry powder pigment to avoid inhaling the dust. Soluble cobalt compounds as well as cobalt metal may have a sensitizing effect. However, none have been reported during the experience of many years of handling cobalt yellow pigments.